HILLSIDE, N.J. — Growing up in Kingston, Jamaica, Nick Richards loved competing in soccer, volleyball and track and field. But his life changed forever when, in the summer of 2013, a New York City basketball scout named Andre Ricketts discovered Richards at a basketball camp in his home country. “He found me in Jamaica and he brought me up here,” the 6-foot-11 Richards told me. At that stage, Richards never imagined he could earn a Division 1 scholarship based on his raw basketball abilities. “No, when I was there that never really came across my mind,” he said. After initially landing at St. Mary’s High School on Long Island, Richards didn’t realize basketball could get him to college — and maybe beyond — until “probably like the beginning of my junior year.” By that stage, he had transferred to New Jersey power St. Patrick’s, now known as The Patrick School. On Thursday, Richards took the latest step in his journey when he became Kentucky’s first commit in the Class of 2017. Ranked the No. 2 center in the Class of 2017 by 247Sports.com, Richards chose Kentucky over Syracuse and Arizona. Richards has visited Kentucky twice in recent weeks, once on an official visit and again for Big Blue Madness. Kentucky coach John Calipari has made several trips to St. Patrick’s to see Richards in recent weeks. It’s the same school that produced former Kentucky players Michael Kidd-Gilchrist and Dakari Johnson, as well as former Duke star and current NBA champion Kyrie Irving. Kidd-Gilchrist has also reached out to recruit Richards to Kentucky. “Honestly, I couldn’t choose between the three schools that I picked so me and my family had to come to a common ground and we came to Kentucky,” Richards said. “[Coach Calipari] always talks about me growing as a player and as a person and just working on getting better,” he added. Mike Rice, the current Patrick School and former Rutgers coach, has worked with Richards the past several years and says his upside is huge. 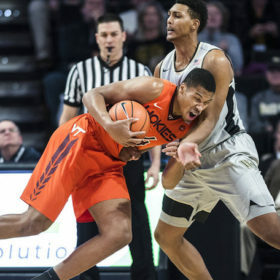 Richards has only been playing organized basketball for about four years since leaving Jamaica and was known early on as a defensive specialist. But he has expanded his offensive game in the last year or so to the point where he now has a hook shot, a jumper out to 15 feet and a repertoire of post moves. 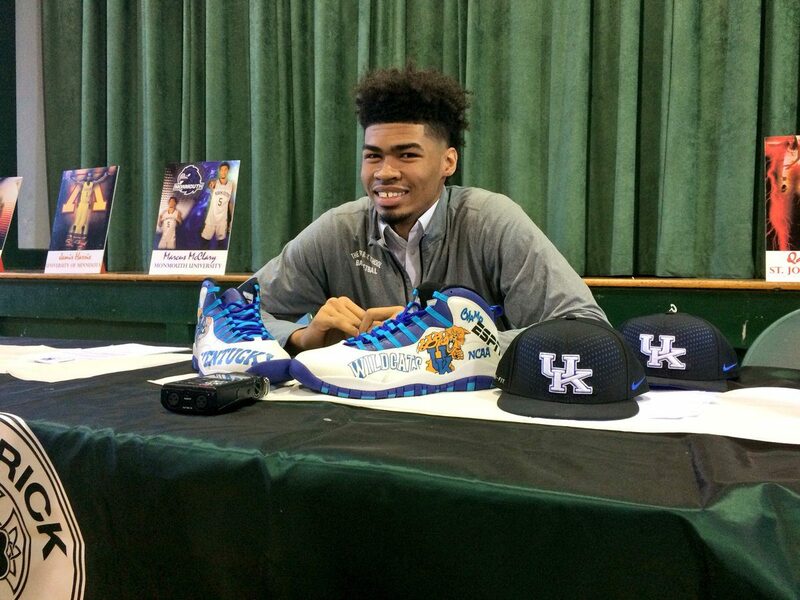 Rice says Kentucky is also getting a solid citizen and a nice young man. “You’re getting one of the hardest workers and someone who does it with a smile on his face,” Rice said. “When you’re dealing with Nick, Nick is a sponge and Nick wants and understands that every day is a challenge to improve. And you get that in a young man with that much of a natural talent, and that’s why where he is now. He’s a top-10 player in the country. Rice says Richards has pro potential down the road. Richards is Kentucky’s first 2017 commit, but Findlay Prep forward P.J. Washington is due to announce later Thursday between Kentucky, North Carolina and UNLV. Kentucky remains in the mix for several other 2017 stars, including guards Shai Alexander (who announces on Monday) Quade Green (who announces Nov. 19) and Trae Young, wing Kevin Knox and big man Mohamed Bamba, who will commit in the spring. Richards is one of five Patrick School to commit D-1 this fall, following guards Jamir Harris (Minnesota) and Marcus McClary (Monmouth) and bigs Bul Ajang and Buay Koka (Tulane). The other four signed on Wednesday. Together, the group has one united goal: the New Jersey Tournament of Champions title.